Quinn C1, Cooke J1, Deegan B2, Breen P2, Hannigan A3, Dunne C3, Lyons G2 and Lyons D1. Discomfort has been identified as a limiting factor for the use of surface NMES. Early implementation of NMES devices were so uncomfortable that they could only be used when the patient was under anaesthetic1. Furthermore, poor quality electrodes combined with monophasic waveforms often resulted in skin irritation and burns. Pambianco et al had to discontinue the NMES portion of the effects of heparin, intermittent pneumatic compression and NMES on DVT rates in stroke rehabilitation patients due to discomfort and skin blister formtion2. More recently the inclusion of microcontrollers in the design of NMES devices has allowed the implementation of precisely controlled waveforms and novel algorithms3. These waveforms and algorithms have significantly increased the comfort and tolerance of NMES users. Moreover the use of biphasic pulses, either asymmetric or symmetric has minimised ion redistribution and the subsequent risk of skin irritation and burns. Previous studies have examined patient perceptions of NMES. Alon et al. examined the effect of 4 different electrode sizes on excitatory responses (sensory, motor, pain and pain tolerance) on healthy participants and concluded that NMES comfort increases with increase in electrode size4. They also observed that increasing electrode size decreases the peak voltage corresponding to the excitatory levels. Clarke-Moloney et al assessed the comfort associated with and without NMES on patients with chronic venous insufficiency using a visual analogue scale (VAS)5. The authors found that the comfort categorical rating remained unchanged in all but one patient. This indicated that patients found NMES to be an acceptable therapy which could be significant in future studies involving NMES treatments for venous wound healing. Broderick et al. previously conducted a study involving healthy participants who underwent a 4 hour stimulation protocol6. Three participants indicated moderate discomfort and 7 only mild discomfort when NMES was commenced. By the end of the study, 2 participant’s scores increased to moderate while 2 other participant’s scores decreased to mild the remainder were unchanged. Kaplan et al. asked each healthy participant who received NMES of the calf or foot muscles to complete a questionnaire regarding the acceptance of NMES. Both groups found NMES to be comfortable and strongly felt they would use the NMES device if directed by their doctor7. More recently a study by Corley et al. demonstrated the use of a week-long NMES blood flow protocol in conjunction with compression stockings resulted in a high level of compliance and no reported adverse effects8. Our pilot study concluded that NMES may be useful in attenuating blood pressure drops in older subjects with OH. The asynchronous NMES setting demonstrated the most favourable haemodynamic response. The aims of this study were to assess tolerance and acceptability of both synchronous and asynchronous NMES settings in a young, healthy population during head-up tilt testing. A secondary objective was to assess the effect of both settings on haemodynamic parameters in this group. Healthy subjects (n=14) were recruited. Ten were male. The subjects’ medical history did not reveal any episodes of vasovagal syncope, cardiovascular diseases or any other morbidity. None of the subjects used any medication, and all subjects were non-smokers. Ethical approval for this study was granted by University Hospital Limerick Research Ethics Committee. All subjects gave written consent to take part in the study. Subjects were asked to fast for a maximum of two hours beforehand. Studies were performed in a quiet syncope syncope laboratory room at ambient temperature (21-23 C). The tilt protocol was completed between 9am and 5pm. The study protocol included 3 Head-Up-Tilts (HUT) comprising asynchronous, synchronous settings and control. The order of each intervention was randomly assigned using closed envelope randomisation technique. HUT testing was performed using standardised conditions in accordance with the 1996 expert consensus document for all patients9. Subjects were required to rest in the supine position for five minutes prior to the onset of a 70 degree positive tilt. This was sustained for three minutes as per European Society of Cardiology guidelines10. Haemodynamic changes were recorded using non-invasive beat-to-beat digital artery photoplethysmography Finometer® Pro Device (Finapres Medical Systems BV, Amsterdam, The Netherlands www.finapres.com). Continuous cardiac monitoring was performed with three lead ECG (figure 2). OH was defined as a drop in systolic blood pressure of ≥ 20mmHg or in diastolic blood pressure of ≥ 10mmHg within three minutes of orthostasis10. The delta (or change) in systolic blood pressure (SBP), diastolic blood pressure (DBP), heart rate (HR), mean arterial pressure (MAP), stroke volume (SV), cardiac output (CO), and total peripheral resistance (TPR) were recorded in each subject at baseline and at the lowest point (nadir) for each HUT. NMES was applied a custom built, two channel stimulator (Duo-STIM, Bioelectrics Research Cluster, NUI Galway)11. NMES was facilitated through the use of two 5 cm×5 cm PALS self-adhesive, hypo-allergenic, skin surface electrodes (Nidd Valley Medical Limited, England) placed over the motor points of the soleus muscles of both legs of consenting patients12 (Figure 3). The stimulator was programmed to provide a pulse width of 350 µs, an inter-pulse interval of 100 µs, a frequency of 36 Hz, a contraction time of 1.2 second, a ramp up time of 500 ms and ramp down time of 300ms. This yielded stimulation amplitudes of 29.18 ± 4.2 V11. The stimulation parameters were selected at a level to achieve maximum blood flow while ensuring subject comfort. A series of test pulses were applied initially at a very low intensity to establish that the patient was comfortable with the sensation of electrical stimulation. The stimulus intensity was gradually increased until a noticeable contraction was observed for both legs, as indicated by a visible tightening of the soleus muscle or slight plantar flexion. Stimulation was applied alternatively to each leg with 3 second rest between contractions or synchronously to both legs with 3 second rest period at the onset of each HUT and continued for the three minute study duration. Duplex Doppler ultrasound was used to monitor the subjects’ lower limb venous hemodynamic responses using a Siemens Sonoline Sienna ultrasound machine with a broadband array probe (Frequency 5 – 13 MHz). All measurements were performed by a single examiner. Blood flow measurements were taken from the popliteal vein at the lateral aspect of the knee (Fig. 1). Doppler ultrasound with angle correction not exceeding 600 was used and matched to the diameter of the popliteal vein. All measurements were taken from the right leg. Three measurements were taken per parameter and the average of these was used for analyses5, 13. Peak venous velocity was recorded from the popliteal vein. 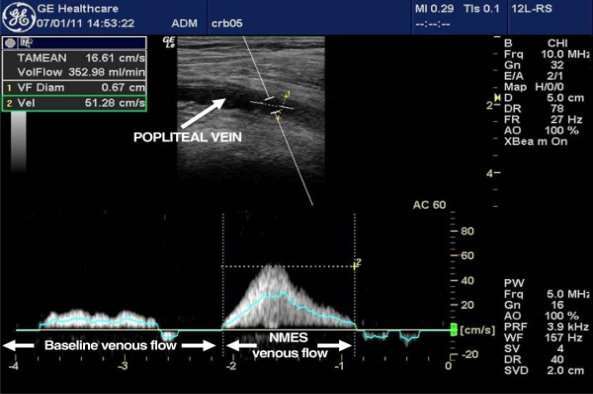 The Doppler machine’s own software was used to calculate venous volume flow (ml/min) by multiplying the average blood flow velocity by the cross-sectional area of the popliteal vein. Doppler measurements were taken at baseline and on assumption of the upright stance. At 2 time points (just after set-up of the NMES and at the end of the protocol), comfort was assessed by asking subjects to mark their level of comfort using a 100 mm, non-hatched visual-analogue scale (VAS). A VAS of 30 mm or less was categorised as mild pain, between 31 and 69 mm as moderate pain and scores of 70 mm or greater as severe pain. The minimum clinical significant difference (MCSD) in VAS was set as an increase in scores between test stages of 12mm14. To give a verbal categorical rating of the NMES treatment as very comfortable, comfortable, bearable or unbearable. To clarify preferred stimulation pattern. If they would consider NMES an acceptable form of treatment. Each subject was asked to mark the degree of symptoms encountered during the HUT using a 100 mm, non-hatched visual-analogue scale (VAS) once the tilt table had returned to the horizontal position. Browse NL, Negus D. Prevention of postoperative leg vein thrombosis by electrical muscle stimulation. An evaluation with 125 I-labelled fibrinogen. Br Med J 1970;3:615-618. Pambianco G, Orchard T, Landau P. Deep vein thrombosis: prevention in stroke patients during rehabilitation. Arch Phys Med Rehabil 1995;76:324-330. Broderick B, Breen P, OLaighain G, Eelectrical stimulators for surface neural prosthesis. J Autom Control 2008;18:25-33. Alon G, Kantor G, Ho HS. Effects of electrode size on basic excitatory responses and on selected stimulus parameters. J Orthop Sports Phys Ther 1994;20:29-35. Clarke-Moloney M, Lyons GM, Breen P, Burke PE, Grace PA. Haemodynamic study examining the response of venous blood flow to electrical stimulation of the gastrocnemius muscle in patients with chronic venous disease. Eur J Vasc Endovasc Surg 2005;31:300-305. Broderick BJ, O’Brien DE, Breen PP, Kearns SR, OLaighin G. A pilot evaluation of a neuromuscular electrical stimulation (NMES) based methodology for the prevention of venous stasis during bed rest. Med Eng Phys 2010;32:349-355. Kaplan RE, Czyrny JJ, Fung TS, Unsworth JD, Hirsh J. Electrical foot stimulation and implications for the prevention of venous thromboembolic disease. Thromb Haemost 2002;10:35-45. Corley CJ, Breen PP, Birlea S, Serrador JM, Grace PA, OLaighin G. Hemodynamic effects of habituation to a week-long program of neuromuscular electrical stimulation. Med Eng Phys 2012;34:459-456. Benditt DG, Ferguson DW, Grubb BP, et al. Tilt table testing for assessing syncope. American College of Cardiology. J Am Coll Cardiol. 1996;28: 263-275. Brignole M, Alboni P, Benditt DG, et al. Guidelines on management (diagnosis and treatment) of syncope-update 2004. Executive Summary. Eur Heart J. 2004;25: 2054-2072. Breen PP, Corley CJ, O’Keeffe DT, Conway R, OLaighin G. A programmable and portable NMES device for foot drop correction and blood flow assist applications. Med Eng Phys 2009;31:400-4008. Baker LL, McNeal DR, Benton LA, Bowman BR, Waters RL. Neuromuscular Electrical Stimulation – A practical Guide. 3rd ed. Downey, California: Rancho Llos Amigos Research and Education Institute; 1993. Izumi M, Ikeuchi M, Mitani T, Taniguchi S, Tani T. Prevention of venous stasis in the lower limb by transcutaneous electrical nerve stimulation. Eur J Vasc Endovasc Surg 2010;39:642-645. Kelly AM. The minimum clinically significant difference in visual analogue scale pain score does not differ with severity of pain. Emerg Med J 2001;18:205-207. "Tolerability and Haemodynamic Effects of NMES." UKEssays.com. 11 2018. All Answers Ltd. 04 2019 <https://www.ukessays.com/essays/medical/tolerability-haemodynamic-effects-nmes-7422.php?vref=1>. "Tolerability and Haemodynamic Effects of NMES." All Answers Ltd. ukessays.com, November 2018. Web. 24 April 2019. <https://www.ukessays.com/essays/medical/tolerability-haemodynamic-effects-nmes-7422.php?vref=1>. UKEssays. November 2018. Tolerability and Haemodynamic Effects of NMES. [online]. Available from: https://www.ukessays.com/essays/medical/tolerability-haemodynamic-effects-nmes-7422.php?vref=1 [Accessed 24 April 2019]. UKEssays. Tolerability and Haemodynamic Effects of NMES [Internet]. November 2018. [Accessed 24 April 2019]; Available from: https://www.ukessays.com/essays/medical/tolerability-haemodynamic-effects-nmes-7422.php?vref=1.